Ugh, I’m so sad Vegan MoFo is over. This was a great month for me and my blog. I was worried I wouldn’t be able to pull it off, as I started a new college program at the same time. I did it though! And my blog got featured on the Vegan MoFo Roundup, mid way through. I had met all the success markers I had set for myself in participating in this, including over 500 views. I actually doubled that amount! This was my most successful month of blogging to date, which is not surprising as MoFo provides a lot of the ability to be successful by participating in it. The trick is to a stress-free MoFo while being quite busy, I found, is to plan it out early. I made a calendar of recipes in advance, tested them, photographed them and did not stray too much from that! I met and interacted with a lot of great bloggers that I haven’t been able to before, which was really nice. I have a bunch of new vegan blogs to follow now full of awesome people! I have a lot of exciting things planned in the coming month as well, so don’t stop checking out my blog! Tonight I am going to be testing out a recipe for spinach raviolis with butternut squash and sage filling which I hope to post soon. I may even be doing a cooking demo for them in RI. October is my Birthday month, and I have a birthday cake waffle recipe I’ll be sharing soon! There will be other posts too that relate to my vegan education project for new vegans or people interested in becoming vegan, in which I’ll be addressing common concerns and how to deal with them. If you have any suggestions for things you’d like to see me cover, be sure to comment here or in the future. Now, without further ado, let’s get the final Vegan MoFo recipe for Chamomile Lavender Cupcakes out! Makes a dozen regular sized cupcakes. Preheat oven to 350 degrees F. Line a cupcake tin with twelve cupcake liners. In a food processor, blend the sugar, chamomile tea and lavender until ground well and very fragrant. Be careful upon opening the food processor, as there will be powder coming out…don’t inhale! Whisk the sugar and herb mix, almond milk, and coconut oil in a medium large size mixing bowl. Mix in the baking soda and powder. Add vanilla extract and stir until everything is mostly smooth. The batter will be a bit clumpy with the coconut oil and that’s okay. Place about 2 tbsp of the batter in each muffin tin. Bake for about 15-20 minutes or until a toothpick comes out clean when inserted in the middle of the cupcake. Wait 5 minutes and then place on cooling racks. Allow to cool completely before decorating with the icing. With a small whisk, mix up the coconut oil and powdered sugar in a small bowl until large crumbs form. Add the coconut creamer and whisk until smooth. Add the optional extract and food coloring and mix until satisfied. 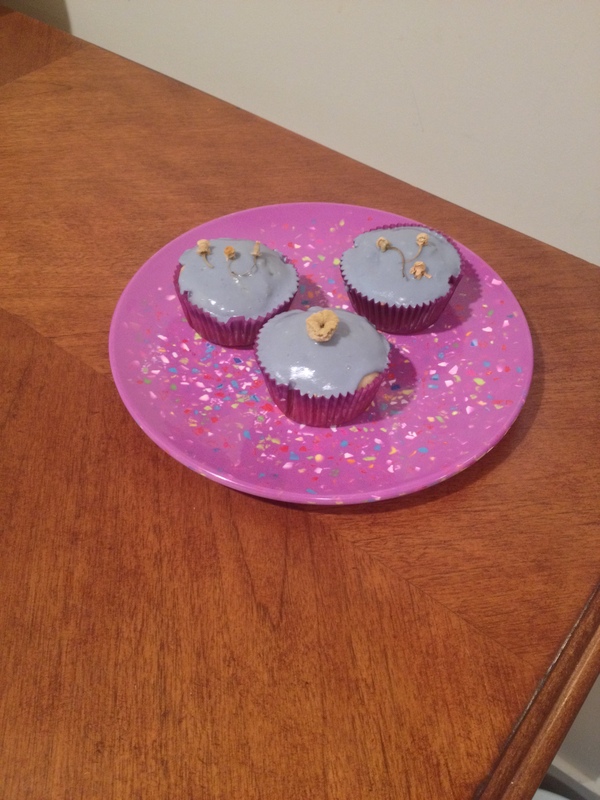 Use a frosting spatula and place a thin layer of the icing on each cupcake. Decorate with dried chamomile flowers. Bye, Vegan Month of Food 2014! See you next year in 2015! I already cannot wait!